same day. His summer was equally filled with cricket. He came to athletics later when persuaded by a workmate to turn up at Pembroke`s then headquarters, the Sefton Arms, for a `jaunt’ over the country. This turned out to be the club`s novice championship and he duly finished fourth. There was no turning back. He was thereafter a regular team counter and did not miss a single District, West Lancashire or Northern Championship in the ten years preceding the Second World War. 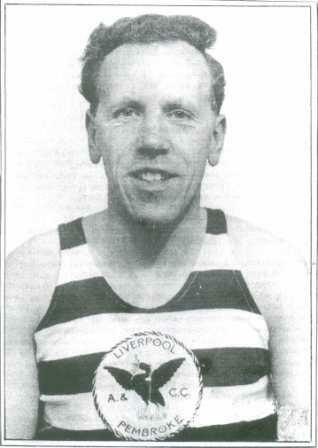 He was also a dedicated road runner and in 1938 ran 2.52 in the Warrington Marathon. War came along and Charlie volunteered along with other Pembrokians and was sent to France with the Royal Engineers from whence he returned fairly rapidly via Dunkirk. He spent a couple of successful years in the South of England running for Eastleigh and later Mitcham but was eventually posted to Egypt where he returned to playing football. Undoubtedly his most intruiging sporting achievement was as a fencer. With Liverpool Fencing Club in his pre-war days he had won no fewer than 6 Northern Sabre Championships. In 1939 he gained international honours winning 5 out of 7 encounters against France and the three other home countries. Whilst in Cairo he became a member of the Royal Egyptian Fencing Club and frequently crossed blades with King Farouk`s bodyguard! The war over he went to work for the Liverpool Police and began to concentrate on athletics. He was keen on Marathons but a succession of injuries frustrated his career. In parallel he began to take up numerous administrative roles within the club and elsewhere. As Treasurer he was formidable. As a young member I was always terrified that I would not be deemed up to date with my subs. Charlie only asked once! In the fifties he became a founder member of the Road Runners Club and eventually a Vice-President. Charlie was definitely of the old school of runners, totally uncompromising in everything he did. Even training runs with him were fierce.There are few of his contemporaries left but those of us he knew him as younger recruits to the sport recall the enormous respect he engendered. He occupies that special Pembroke niche reserved not just for talented athletes but `characters’. Goodbye, Charlie (from the other Charlie).